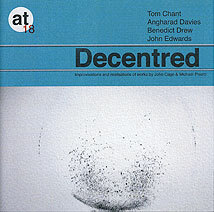 Tom Chant, saxophones, bass clarinet; Angharad Davies, violin, objects; Benedict Drew, electronics, objects; John Edwards, double bass. Recorded on 4 January 2009 at St. James' Church, Friern Barnet, North London. Cover design (front cover reproduced above) by Benedict Drew.